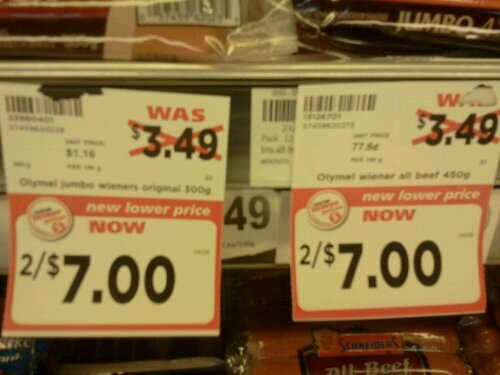 Took it while shopping for groceries the other day, this is a great offer no one can resist. 1 pack of wieners for $3.49 or 2 for $7! As a matter of fact, most of the store was offering “discounts” and “special offers”. I’ve noticed that in this particular store, they normally have a rotation of offers to keep products circulating. In this way, you would have the store brand products with a discount this week and next week it would be the brand name ones.Discount doesn’t have to be great, just enough to show a special and keep customers looking for them. However, in recent times most stores are going “discount crazy”, including this particular store. Mind you, not that the offers are really great, most just return things to the no discount price they were a couple months ago, such is the nature of inflation. Some, like the one here, are not even a real offer… you pay 2 cents more!